Public school teaching in North Carolina has sunk into a crisis that it may not recover from, and the Republican leadership in this state bears the principal blame. “We’ve disincentivized teaching pretty much on every level,” Sean Bulson, superintendent of the Wilson County public school system, told an NC House select committee on education. “All of the things that affect supply and demand in teaching are the things we’ve chipped away at over the last few years." On Wednesday, State Superintendent of Public Instruction June Atkinson told the same committee that teacher salaries need to rise ten percent to begin to repair the damage wrought by the recession (under Democratic rule) and which accelerated exponentially under The Gang That Doesn't Like Public Education. Raise teacher salaries by ten percent, Atkinson told the lawmakers. A day later -- yesterday, to be exact -- House Speaker Tim Moore came before the same select education committee and told them to fuggetaboutit. For the first time ever, according to Beverly Emory, superintendent at Winston-Salem/Forsyth schools, her district had 25 elementary school vacancies when the school year started. Frank Till, Cumberland County superintendent, said his district started the school year with 50 vacancies. Affluent schools, where a job opening once would attract seven or eight applicants, are now “lucky to get one for some positions,” he said. There did not use to be any shortage of elementary teachers in the state. Now there are shortages at every level, because who wants to grow up and be a public school teacher in North Carolina, where your work is neither understood nor honored, where your higher degree will earn you nothing extra, where the legislative leaders signal their attitudes toward your job by continually looking for ways to siphon money off to private, unaccountable, for-profit enterprises that go under the heading of "schools"? 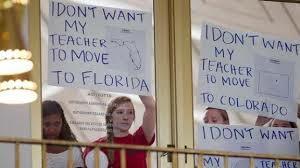 Until that bunch in Raleigh are retired, sent home, or promoted to higher elective office, where maybe they can ruin the entire country, our public schools are on virtual life support. I did some quick math on the 10% raise issue. If the 10% raise was instituted and all other states didn't increase teacher pay we would move up to approximately 25th in the country. However, other states will increase pay, so it would probably put us in the low 30's. A lot better than the upper 40's where we are ranked now. It's sad that it would take a double digit raise to put us in the middle of the pack. NCGOP has thoughtfully and deliberately destroyed NC education from K through HS. They've got their hooks in UNC-system (witness the protests, arrests, etc. since Delores Umbridge was named president, ongoing budget slashing.) The goal: total destruction of all education in NC - from K through college. Anonymous - I don't look to blame anyone. I look for an honest assessment....evaluate the issue....fix the issue. Blaming the leadership or the previous leadership serves no purpose. There will be a major turnover in legislators this election. The majority will probably not change, but there will be new people. Maybe, more people like me. All I can do is fight for what is right and try to bring the truth to light. Unfortunately, changing the trajectory of issues like this are slow. But, with sustained effort it can/will happen. exc article camel city dsptch re w-s ongoing nightmare. "Blaming the leadership or the previous leadership serves no purpose." With regard to education, North Carolina is in the midst of a catastrophe - and yes, I (and many others) blame the current leadership of the state government. They are systematically destroying public education - from K through college. For a party that keeps loudly talking about "the market" and bringing "private sector" discipline into the public sector, NCGOP leadership seems willfully ignorant of the importance of talent - valuing talent, rewarding talent and even recognizing talent. NCGOP seems intent on only fighting - they can't even come to a consensus among themselves about anything. In all my life, I've never seen any party so intent on swift destruction of a public good - the educational system of NC. If they want to say that there is no talent in NC, that's one thing. But that's not true. NCGOP policies, however, will make that happen - the lack of incentives for public employees, teachers, etc. will drive the best talent to leave this state. And that's a tragedy in the making right now. We need to keep government out of education. All they give us is common core, gay rights education over reading, writing, and rithmatic, and a lack of corporal punishment. When kids are not allowed to learn the basics, often times due to disruptive atmosphere, replete with poltically correct subjects, it sets the U.S. far behind the other nations who understand pushing liberal agendas doesn't support education at all. The liberal socialist sheep gave us poor education with irrelevant subject matter and teacher unions and then wonder why our education systems are so screwed up. Typical liberal sheep - too dumb to understand how they foul their own nest. Your ole pal. I guess Rodger Young and the Republicans state legislature would like to return to the "good old days" of the early 19th century when "the government" wasn't in the business of public schools. A wonderful time when most people barely learned how to read and do math at home while a wealthy few sent their kids to private schools for an education. As for his little rant, I'll just say that I attended public school in NC in the 70s and 80s and still remember getting called in twice for school assemblies where the Gideons were handing out Bibles and some of the teachers were spouting Bible verses and Creationism nonsense. Anonymous and Rodger Young - This goes to my point of it's easy to blame and say what isn't working. It's another to assess the problem without prejudice and come up with a solution. Our legislators and citizens for that matter do more of the blaming and what is wrong and less of the solutions. Anon - I stand by my comment about blaming not serving a purpose. Rodger Young - You say you don't think the government shouldn't be in education. Let's wave the magic wand and say that is so....what does education now look like? To be honest your comment comes off crazy. But, I bet if you give us a reasonable and well thought out solution there will be at least part of it people can agree on. I'm guessing part of your solution is that without interference from the government local education leaders will be empowered and will be more effective in educating our children. Most people will agree with giving more freedom to our superintendents, principals, and teachers. Focus on solutions to problems....not whose fault the problem is. I posted a post regarding what education would look like without government intrusion but it hasn't been posted yet. See a rural Kentucky 8th grade end of the year exam and look at how far our education has sunk via a government run system. Lew - of course you do not want blame affixed for this problem. But in fact, NCGOP policies are destroying NC public education. What your colleagues are doing has catastrophic consequences for NC's future. And yes, that needs to be addressed... hopefully at the ballot box in November. I must say, I have really appreciated these well thought out and reasonable comments from Lew Hendricks and I am very glad to see a moderate Republican voice in support of education. As a moderate but left-leaning Independent, this gives me hope that we might be able to elect into office representatives from both parties who are willing to listen and to work with each other, and focus on making our state better. Looking for solutions rather than blame sounds great to me! My message isn't popular in Raleigh. The GOP Caucus leader called me late summer to try to get their hooks in me. After they realized I was going to represent the best interests of a rural district and not be a "Team player" they called in the big guns to fund Jordan's primary against me. Below is a short list of some of the donors he had in the November 2015 time frame. I pulled this info off the latest campaign finance report which is a public document. I don't know about you, but with support like this from outside the district it makes me wonder who he is really representing. Unfortunately, money wins elections. I have to count on grassroots and for people that like my message to tell others. I'm waiting for my thank you card from Jordan for raising all that money for him.